Hello guys! This past weekend was so crazy! The storm that hit our mountain town was pretty big and we spent a few days without power in our house. 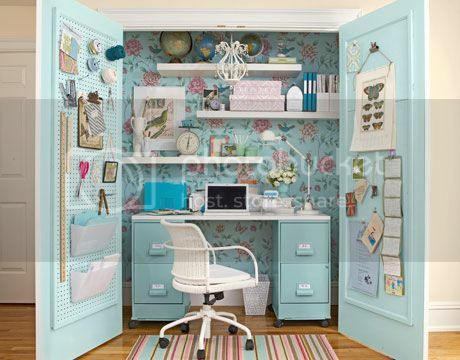 Don't you just love the closet desk idea? 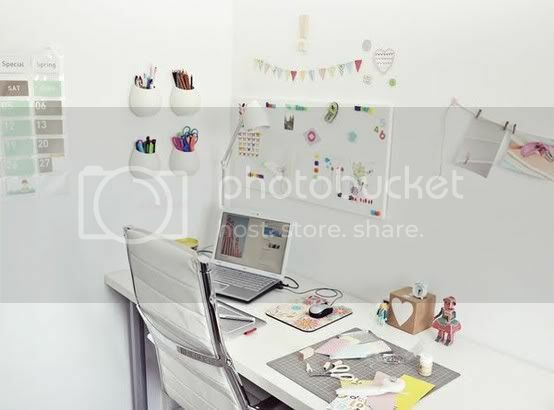 And if you are looking for more craft office eye candy, check out my Pinterest board craft and Office Inspiration. I just wanted to share a little bit of pinning etiquette along with this post too, because I see more and more people that start to pin from the main page of a blog or from Google searches. Always remember to pin from inside a post, why? because when you want to come back to see the post where you took the image from (just imagine that perfect recipe you just pinned) it could be archived far from where you originally see it, remember that blogs have a new post every week and searching for a post with just an image is a pain!! I love that Pinterest. My bookmarks are overflowing and at times it’s really hard to find that inspirational photo I bookmarked earlier. I’d really appreciate an invite to Pinterest! Thanks a lot! I would love an invite also! Also, those closet craft rooms are my favorite and since my legs are pretty short, I could totally do it. Thanks for the little bit of inspiration. Thanks for the invite!! I love it! I’d love an invite! This post has me so inspired! I’ve just found your blog while looking for upcycled clothing ideas. 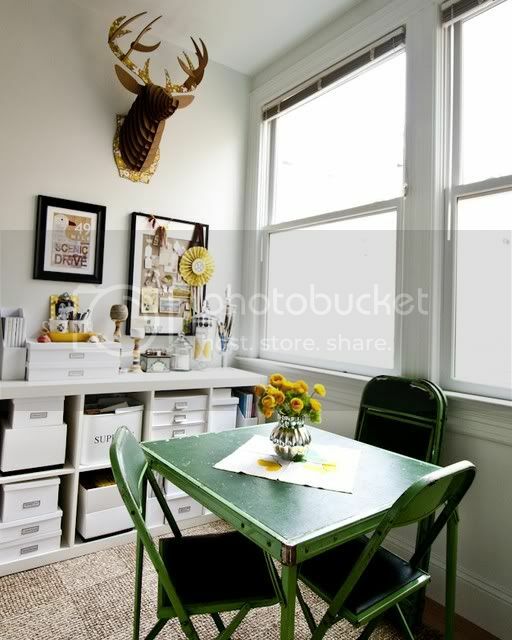 Beautiful blog you have here – and I love those creative spaces – especially the closet ones! I wanted to ask if you’d like to link up your upcycled dress from a very large man’s shirt tutorial from August last year? I’ve just set up a new page on my blog to try and pull together the great tutorials and ideas for upcycling clothes that I’m finding. There are so many fantastic ideas and tutorials out there – it would be good to have them all in one place so more people can find them. It’s not just a weekly linky party – but a page that will remain as a link to your project all the time! I would love if you came to take a look! Your tutorial is fantastic! I would love some info on the Pinterest please!! 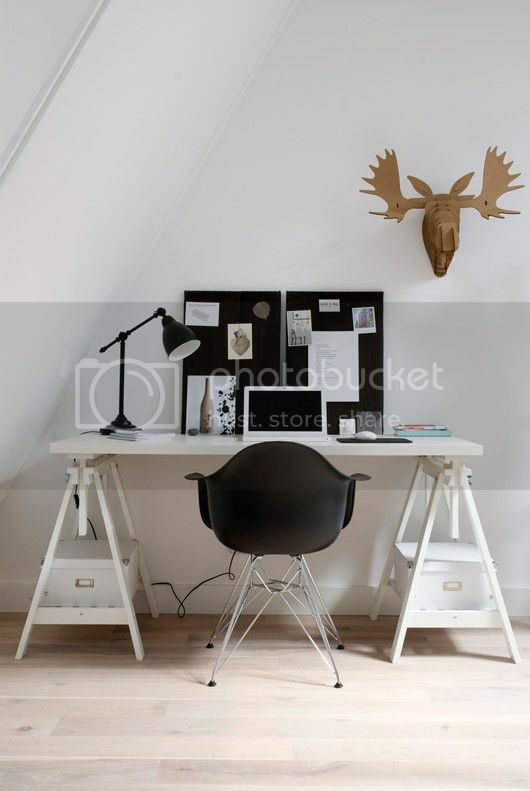 Love these work spaces too! I want to make a chalkboard TO-DO “list” so bad!!! How inspirational! I have a quaint little workspace in our kitchen but can’t wait for a full-on craft room one day. Thanks for sharing. Joy I would love an invite too. I had never heard of this site. It makes perfect sense. I like Jodi have short legs and that closet/craft area is amazing! I could not even believe it when I saw it.. the bonus is that its pink. I looked over your Pintastic and if you still have invites available, I would really appreciate one. My Bookmarks are beginning to conspire against me, and I am somewhat scared to add any more. Thanks and congrats on keeping a beautiful blog. Hello Joy! I was searching for upcycled clothing inspiration and found your sun dress from a mens’ 6x shirt. Brilliant! I love it. Then, I was looking around on your blog… I have SO bookmarked you! :) THEN, I found the Pinterest! I SO need an invite! Please. Now I just need more time in my day! ;) Thanks! I would love an invite if you still have one available. I can totally relate to the overflowing bookmarks! The first 2 pictures are my absolute favorite! I would love to be able to close a door or the cabinet. It would be wonderful. Please send me an invite if you are able! Thank You! found your site by way of Curbly & the magnet bar calendar. very clever! if you have any pinterest invites, i’d love one too! Oh I would LOVE to be invited to Pinterest! I have faaar too many bookmarks and unidentified screenshots on my computer. Wish I could have that first craft room idea! LOVE it. Hello, Luv your blog BTW. The table legs in pictures 6-9 what kind of legs are these, do you know? also do you know where to get them? I LOVE your blog. So many good ideas. Sigh. Now to find the time. MAKE the time. Anyway, I have come across pinterest a few times and am not quite sure what is it except that I like it. How do I join? I just sent you an invitation, hope you enjoy! Could I please have an invite!!!!!!!! I have been wanting to join pinterst for a long time now! 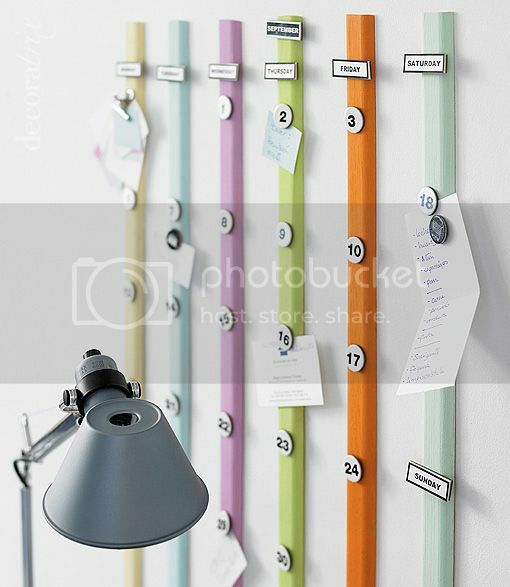 I absolutely love the magnetic calendar idea. I make/take notes for just about everything and to be able to attach them to the day I would like to complete my note to myself would be magical. I’m also a sucker for a cute organized craft room. I think it’s my jealousy showing. I don’t think I could ever have an organized craft space. I don’t think it’s in the cards for me no matter how much i try. Cute pictures and ideas. Thanks for sharing! I’ve made several part of the craft-room inspiration post because there is too much goodness out there! =] I hope you have a lovely day! Wow, thank you for this great inspiration!!! I absolutely love your ideas! I am going to try some! I would love an invite! I love your many ideas thank you for sharing them. I discovered this via stumbleupon.com and while stumbling I often come across pinterest pages and gazed at them adoringly. I’ve requested an invite a few times and have waited hopefully for months to no avail. Seeing the many comments on your page referring to invitations to pinterest has provided me with a bit of hope that my wait may perhaps be over….could I pretty please have an invite to pinterest? It would be extremely appreciated. What a beautiful blog page! I’m inspired now. And I would love a Pinterest invite. Oh you are such a sweetheart. I have been trying to find an invite to Pinterest. I’m really motivated to be craftier this year! Your blog is very inspiring. Thanks for sharing. Love the Blog- starting my own desk. Would love a Pinterest if you have any more left. I would love an invite. Been hearing a lot about Pintrest. Your craft areas are wonderful! If you have any invites left, I would love one as well :o) Your inspirations are beautiful. Thank you, Have a blessed day!! 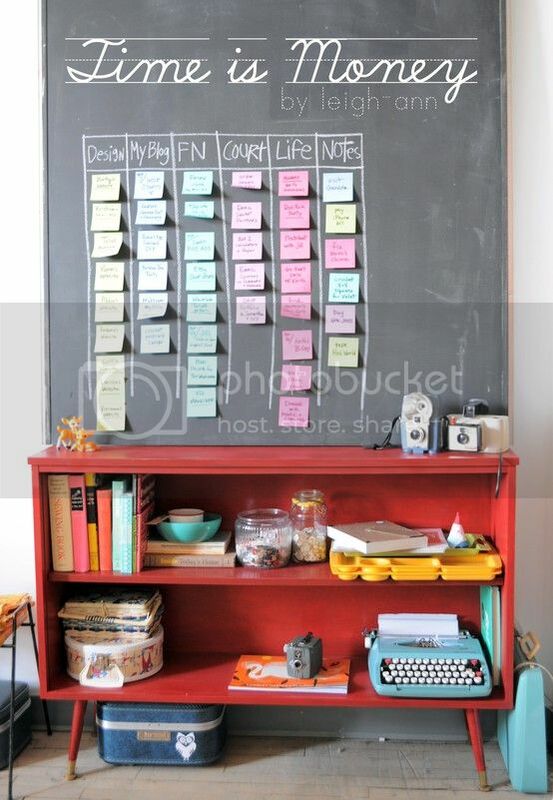 These are great ideas for craft/office space. Thank you for the blog.